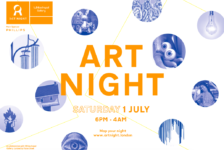 Art Night, one of the UK’s largest free arts festivals supported by international auction house Phillips, is taking over London’s East End with art, performance and music by some of the world’s leading artists on Saturday 1 July 2017 from 6pm to 4am. Art Night is inspired by the international Nuit Blanche movement, first initiated in Paris in 2002. Art Night 2017 is a collaboration with Whitechapel Gallery, curated by Fatoş Üstek. For one night only, internationally acclaimed artists have transformed unusual spaces across east London, from historic and iconic sites to secret locations and public areas. The highlights include Jake and Dinos Chapman animating a vacant warehouse at London Dock, Ian Whittlesea leading guided meditation sessions in the Bascule Chamber of Tower Bridge, Melanie Manchot inviting the public to join a mass dance performance in Exchange Square, a new installation by Lindsay Seers in a hidden Masonic Temple next to Liverpool Street, and a one-off performance by Benedict Drew with a group of leading experimental musicians at Whitechapel Gallery. With cultural venues, galleries and local businesses joining the Associate Programme, there are 60 additional events taking place on the night throughout the East End, making Art Night one of the largest free art festivals in the UK. Highlights of the Associate Programme include Thomas More Square being transformed into an immersive utopian garden by Estela Oliva, a night of film screenings with Frieze Magazine at the new Curzon Aldgate cinema, a political poster campaign and workshop at Ace Hotel London called Time for Outrage!, an interactive installation by Candida Powell-Williams at Devonshire Square, and new virtual reality works by artists Christian Lemmerz and Paul McCarthy presented by Khora Contemporary at creative workspace Second Home – with music and cocktails until midnight. The programme draws inspirations from the East End’s rich history and the cosmopolitan and creative environments of today. Many of the Festival’s commissions are site-specific works which respond directly to the area’s fascinating buildings and locations. Charles Avery is showing objects and characters from his fictional Island across east London; from sculptures, performers and a flyposting campaign, to the transformation of White Mulberries café at St. Katharine Docks into the bar of The Egg Eating Egret – serving free egg cocktails to visitors. Jake and Dinos Chapman have created a new video installation The Misshapeness of Things to Come in a listed warehouse at London Dock, accompanied by a live performance by Jake Chapman and his band. A selection of the Chapmans’ defaced prints has been inserted into Dennis Severs’ House, an 18th century candlelit Huguenot house. Benedict Drew is working with experimental musicians for a durational performance with video and live music as part of his major multi-media installation at Whitechapel Gallery. Anne Hardy has created an immersive installation consisting of sound, sculpture and light in the former headquarters of the Nicholls & Clarke building, courtesy of British Land, and an exclusively managed Location House site. For The White Chapel Building, a recently reinvented office space, Lawrence Lek is presenting a virtual reality installation exploring the utopian potential of future workspaces. Melanie Manchot is inviting audiences to take part in a collective dance performance at Exchange Square, Broadgate, in collaboration with 10 dance schools from around the East End, each representing a different style, from Flamenco to Irish Dance and Argentine Tango. A club night at Village Underground features artist Carsten Nicolai a.k.a. Alva Noto and other DJs in collaboration with Boiler Room. A new video installation by Lindsay Seers and unannounced performances are taking over the ceremonial setting of the Grade-II listed Masonic Temple at Andaz London. Korean artist Do Ho Suh is presenting a video installation that responds to the architecture of Christ Church, Spitalfields. Turkish artist Güneş Terkol has worked with Middlesex Street Estate residents to create a new work exhibited in the windows of The Cass, London Metropolitan University, and a permanent mural for the Estate. Ian Whittlesea is inviting audiences to take part in an illuminated meditation inside Tower Bridge’s Bascule Chamber, inspiring them to see the world differently. A group of Art Night Guides will be present at each site, guiding audiences and answering questions about the works and sites. The Art Night Guides programme is supported by Art Fund, drawing on their Student National Art Pass network. Art Night is supported by public funding from the National Lottery through Arts Council England, with additional support provided by Bloomberg Philanthropies. All events are free and open to all, except the Club Night at Village Underground. Art Night is a new annual contemporary arts festival that transforms London for one unforgettable night, presenting acclaimed international art in unusual locations across the city. Each year a leading cultural institution and a curator work in a different part of London for the festival, exploring the area’s history, culture and architecture. The first edition took place on Saturday 2 July 2016 and was guest-curated by the Institute of Contemporary Arts (ICA) with curator Kathy Noble. Art Night was inspired by the international Nuit Blanche movement, first initiated in Paris in 2002. From Riga to Toronto, via Melbourne and Tokyo, this free-to-attend nocturnal celebration of arts and the city was staged in more than 30 cities worldwide and keeps expanding around the globe. Art Night is administrated by ArtCity Nights, a registered charity no 1164449. Art Night was founded by Unlimited Productions – a collective of young cultural entrepreneurs from all around Europe, who decided to join forces to share their passion for art and London with the public. Unlimited produces projects that explore the relationship between arts and urbanism, working with curators and artists to create accessible cultural experiences. Unlimited launched Urban Tales in 2015, a series of events introducing the concept of Art Night. The first chapter, The Bank, invited the public to explore an empty 1920’s bank in the heart of the City of London. For Urban Tales 2, Unlimited took over London’s only lighthouse to showcase a site-specific contemporary opera. Art Night 2017 is presented in collaboration with Whitechapel Gallery whose curators include Lydia Yee, Chief Curator and Emily Butler, Mahera and Mohammad Abu Ghazaleh Curator. Phillips is a leading global platform for buying and selling 20th and 21st Century art and design. With dedicated expertise in the areas of Art, Design, Photographs, Editions, Watches, and Jewellery, Phillips offers professional services and advice on all aspects of collecting. Auctions and exhibitions are held at salerooms in London, New York, Geneva, and Hong Kong, while clients are further served through representative offices based throughout Europe, the United States and Asia. Phillips also offers an online auction platform accessible anywhere in the world, and is committed to supporting contemporary arts and culture through a worldwide programme of Arts Partnerships. 24 Sèvres is the global address for fashion. Bringing together the most respected fashion and beauty names at one address, 24 Sèvres offers the most desirable pieces from renowned maisons and highly coveted emerging designers. Beyond a highly curated selection, 24 Sèvres provides an unparalleled visual experience and accompanies the customer in her discovery of products and trends, bringing a cultural twist to fashion. Absolut launched the #AbsolutNights platform in 2015, as part of its mission to push nightlife forward by challenging conventions – reimagining and reinventing nightlife for all. Today, the #AbsolutNights campaign has the purpose to instigate a more open world within nightlife – a world rooted in connecting people across borders, barriers and labels – inspiring people to be spontaneous and living in the moment. Andaz London Liverpool Street is a five-star luxury lifestyle hotel that offers a vibrant experience truly unique to east guest: blending personal preferences with attentive and uncomplicated service. Part of the Hyatt portfolio, the hotel is global in scale while local in perspective. Immersed in the ever-change, creative culture of its native East London surroundings, every guest feels like a local from the moment they begin their journey at the Andaz London Liverpool Street. Art Fund is the national fundraising charity for art. In the past five years alone Art Fund has given £34 million to help museums and galleries acquire works of art for their collections. It also helps museums share their collections with wider audiences by supporting a range of tours and exhibitions, and makes additional grants to support the training and professional development of curators. Art Fund is independently funded, with the core of its income provided by 123,000 members who receive the National Art Pass and enjoy free entry to over 240 museums, galleries and historic places across the UK, as well as 50% off entry to major exhibitions and subscription to Art Quarterly magazine. In addition to grant-giving, Art Fund’s support for museums includes Art Fund Museum of the Year (won by the V&A, London, in 2016) and a range of digital platforms. Boca is a new Latin American cafe in the City and a one stop for all your favourite Latin bites. Empanadas are the main event, with vegetarian and vegan options as well as meaty fillings for the more carnivorous, but best not ignore other favourites like Brazilian cheese bread, Argentinian biscuits filled with dulce de leche and the much-loved Portuguese custard tart. We are one of Europe’s largest publicly listed real estate companies. We own, manage, develop and finance a portfolio of high quality commercial property, focused on retail locations around the UK and London Offices & Residential. We have total assets in the UK, owned or managed of £19.0 billion (British Land share of which is £12.8 billion), as valued at 30 September 2014. Our properties are home to over 1,000 different organisations and receive over 340 million visits each year. Our objective is to deliver long-term and sustainable total returns to our shareholders and we do this by focusing on Places People Prefer. Broadgate City of London is a 30 acre fully managed business campus in the heart of the Square Mile. Since opening, Broadgate has been progressively developed and now includes 16 separate buildings covering 4.0 million sq ft with a further 710,000 sq ft under development. The office buildings are set around four landscaped squares each providing an attractive working environment enhanced by restaurants, bars, pubs, shops and health clubs. Due to its excellent location – it has been built around Liverpool Street station, the City’s main transport hub – Broadgate has become a dynamic and thriving business community. With over 30,000 workers, it is home to some of the world’s biggest corporations and top professional practices. Broadgate is owned by British Land and GIC. Cass Art is on a mission to fill every town with artists, underpinned by the company’s long standing manifesto. Committed to encouraging everyone to realise their creative talents, Cass Art provides the world’s top quality art materials at the guaranteed best prices. Cass Art has partnered with some of the leading art brands across the UK, including The National Gallery, The Royal Academy of Arts, Glasgow International and Sky Arts, along with local galleries and art institutions. The Contemporary Art Society champions the collecting of outstanding contemporary art and craft in the UK. Since 1910 the charity has donated thousands of works by living artists to museums, including the first works by Picasso, Matisse, Bacon, Hepworth, Caro, Antony Gormley and Damien Hirst to enter UK public collections. More recent acquisitions have included works by 2016 Turner Prize winner Helen Marten in 2012, Phyllida Barlow in the same year and in 2016 the first works by Glenn Brown and Kader Attia to enter a UK museum collection. Sitting at the heart of cultural life in the UK, the Contemporary Art Society brokers philanthropic support for the benefit of museums and their audiences across the entire country. Their work ensures that the story of art continues to be told now and for future generations. Derwent London is London’s leading creative office specialist with 6m sq ft valued at £5bn (Dec 2016). Experienced in pinpointing vibrant locations and properties, with potential to create interesting space, we combine innovative architecture, striking design and active asset management to produce dynamic and exciting places to work. In 2016, we won the EG National Company of the Year and the EG London awards. We are listed as 12th globally (and 1st in the UK) in the 2017 Corporate Knights Global 100 world’s most sustainable companies. The founders of Elephant Gin have dedicated themselves to combining a great passion for gin with the love for the African wildlife. In 2013, they developed the award-winning Elephant London Dry Gin (45%) that uses rare African botanicals and focuses on resolutely artisan production methods. Since December 2015, the com- pany has complemented its portfolio with an aromatic Elephant Sloe Gin (35%) and in March 2017 intro- duced a full-bodied Elephant Strength (57%). Elephant Gin also gives back to the continent that inspired the brand in the first place:The company donates 15 percent of all proceeds from every bottle of Elephant London Dry Gin and Elephant Sloe Gin to two African foundations that are committed to save the African elephant from extinction. Founded in 1991, frieze is the leading international magazine on contemporary art and culture. Published 8 times a year with offices in London, New York and Berlin, and containing essays, reviews and columns by today’s most forward-thinking writers, artists and curators. frieze is essential reading for anyone interested in visual culture. The Goethe-Institut is the cultural institute of the Federal Republic of Germany with a global reach. We promote knowledge of the German language abroad, foster international cultural cooperation and convey a comprehensive image of Germany with 159 locations in 98 countries. In the area of Art and Culture we place importance on engaging with current social and cultural tendencies emerging in Europe and beyond. We initiate collaborations with our partners in the British and German cultural scenes and work closely with our partners on interdisciplinary projects in film, visual arts, music, dance, literature and theatre. At the Goethe-Institut London, located on Exhibition Road, we host many events throughout the year, such as film-screenings, readings, workshops, talks and discussions. Additionally, we organise artist residencies in collaboration with selected partners. Hiscox is a global specialist insurer, headquartered in Bermuda and listed on the London Stock Exchange (LSE:HSX). Our ambition is to be a respected specialist insurer with a diverse portfolio by product and geography. The Hiscox Group employs over 2,300 people in 13 countries, and has customers worldwide. Through the retail businesses in the UK, Europe and the US, we offer a range of specialist insurance for professionals and business customers as well as homeowners. Internationally traded, bigger ticket business and reinsurance is underwritten through Hiscox London Market and Hiscox Re and ILS. Our values define our business, with a focus on people, quality, courage and excellence in execution. We pride ourselves on being true to our word and our award-winning claims service is testament to that. Jack Arts is an independent creative out-of-home agency, specialising in the arts and culture space. For more than 25 years we have been crafting bold and unconventional campaigns that create dialogue on the street in an artful way. An agency with a difference, we run poster schemes in 10 cities across the UK. We also produce one of a kind special builds, murals, installations, ambient and experiential marketing campaigns to cause a welcome disruption on the street. Our experienced team, combined with our creative approach, has helped us build a reputation as the leading out-of-home agency for the arts. Khora Contemporary is the first production company to focus on creating contemporary artworks in Virtual Reality, to research this progressive medium and translate the vision of established and emerging artists into the language of VR. Established in 2016 in Copenhagen by five partners with a common passion for art, experience in VR production and a shared vision of its significance in the art landscape of the future. KCCUK is a leading institution based in London devoted to promoting Korea’s vibrant cultural scene to UK audiences. From 2017-2018, KCCUK will lead the Korea/UK season, a programme of extensive cultural activities taking place across the UK. The season will see multiple institutions – including KCCUK – present exhibitions, performances, residencies, workshops and public art installations of Korean artists. Collaborating institutions include Art Night, BALTIC Centre for Contemporary Art, Delfina Foundation, Eastside Projects, Fact, Gasworks, Hayward Gallery, Liverpool Biennial, Locus +, Site Gallery, Space X, Spike Island, The Showroom and Wysing Arts Centre. By acting as a platform for collaboration, KCCUK aims to exhibit and introduce pioneering Korean artists to wider audiences. Location House provide Access to Architecture for event and film production. Finding incredible buildings is what we love to do. We source unconventional and aspirational properties in London, New York and Los Angeles for event and film production; collaborating with the world’s most sought-after brands to produce exhibitions, trade and fashion shows, launch parties, press days and more. Our specialist team focus on delivering a seamless operational service, drawing from a wellspring of event expertise and a deep understanding of all our architecturally distinctive spaces. Lombard Odier is a leading global wealth and asset manager focused on providing solutions to private and institutional clients as well as to other financial institutions. For 221 years, the firm has been solely dedicated to serving clients and forged a strong tradition of innovation in the way it advises clients, manages investment strategies and develops new technologies. With 233 billion Swiss francs (EUR 218 bn / USD 230 bn / GBP 186 bn) of total client assets, per end-December 2016, Lombard Odier provides a complete palette of wealth management services including among others succession planning, discretionary and advisory portfolio management and custody services. As an independent business wholly owned by its Managing Partners, stability is the watchword. The Partnership model fosters a long term-vision, full alignment of interest and mutual trust with clients. Lombard Odier Group employs about 2,300 people. Headquartered in Geneva since 1796, the Group has 26 offices in 19 jurisdictions including London, Paris, Zurich, Moscow, Dubai, Hong Kong, Singapore and Tokyo. As a champion of innovation and a supporter of the arts, Lombard Odier’s decision to support Art Night chimes with its pioneering spirit. One Crown Place is a major new mixed-use scheme on the edge of the City of London. Located in London’s historic Sun Street conservation area, the development is set to deliver a total of 246 private apartments, a boutique hotel, 140,000 sq ft of premium office space, retail units totalling 7,000 sq ft, and a historic Georgian terrace that will be fully restored as part of the scheme. Designed by award-winning international architectural practice Kohn Pedersen Fox Associates (KPF), One Crown Place is a combination of modern, cutting-edge architecture housing a mix of high specification offices with spectacular apartments across several buildings, including two striking terracotta clad towers, the tallest of which is 33 storeys high. An additional level of character is created through the restoration of the last remaining Georgian terrace in the area, which will house a clubhouse for the residents and a boutique hotel. The first residents will move into One Crown Place in summer 2020. Established in 2003, Outset Contemporary Art Fund is the only international, independent charity that pools donations from patron circles and partners to support the creation of contemporary art. Present in 9 countries, it has raised over £7.5million for artist’s projects worldwide. OUTSET is at the forefront of pioneering arts philanthropy including inviting curators to acquire 100 art works from Frieze for the Tate Collection, creating studios for artists through the initiative of Studiomakers, and supporting the production of art works for biennials around the world. Phillips is a leading global platform for buying and selling 20th and 21st Century art and design. With dedicated expertise in the areas of Art, Design, Photographs, Editions, Watches, and Jewelry, Phillips offers professional services and advice on all aspects of collecting. Auctions and exhibitions are held at salerooms in London, New York, Geneva, and Hong Kong, while clients are further served through representative offices based throughout Europe, the United States and Asia. Phillips also offers an online auction platform accessible anywhere in the world. Phillips also offers an online auction platform accessible anywhere in the world, and is committed to supporting contemporary arts and culture through a worldwide programme of Arts Partnerships. St George is proud to be a member of the Berkeley Group, London’s leading mixed use developer and a FTSE 250 company. We regenerate brownfield land to create thriving new communities in attractive landscaped environments. Since 2000, St George has delivered 9,500 homes, 2,700 (30%) of which are affordable, 920,000 sq ft of commercial floorspace and 83,000 sq ft of community space, as well as 36 acres of open space. Each home St George delivers creates or sustains 5.6 jobs. In 2002 St George was the first residential developer to be granted the Queen’s Award for Enterprise in Sustainable Development. The Berkeley Group as a whole received this prestigious accolade in 2008 and again in 2014. In 2015 the Berkeley Group won the Sunday Times Housebuilder of the Year Award and was awarded National Property Company and Residential Property Company of the Year by Estates Gazette. In addition to the 90 Bow Arts Trust studios, London Dock is currently host to an immersive dining experience and a pop up park. In 2018 JTP architects (formerly John Thompson and Partners) will relocate their offices and studios to London Dock. London Dock welcomed its first residents in December 2016. Second Home Spitalfields is a workspace and cultural venue, bringing together diverse industries, disciplines and types of social businesses. Designed by award-ˇwinning architects Selgas Cano, Second Home Spitalfields is filled with natural light, and features over 2,000 plants and trees. Teams based at Second Home include fast-ˇgrowing companies like Kickstarter, TaskRabbit and Artsy alongside established businesses including Ermenegildo Zegna and Ernst & Young. Our auditorium and Libreria bookshop host a regular programme of film screenings, live music and lectures. Recent events include talks by fashion designer Stella McCartney, architect Richard Rogers and author Michael Chabon. The iconic St. Katharine Docks is Central London’s only marina. A stone’s throw from the Tower of London, Tower Bridge and the City of London, the site has a fascinating history and retains many original features. Opening n 1828, the Thomas Telford-designed dock was once one of the busiest ports in the UK, renowned for handling luxury goods, including sugar, rum, spices, perfumes, wines and tea. Today, St. Katharine Docks is home to a range of leading companies, restaurants and brands. The Aldgate Partnership (TAP) was formed in 2014 to help drive a powerful agenda for change. TAP works in partnership with its members and stakeholders delivering a range of interventions to support community and economic development and upgrade Aldgate into a destination hub with high quality public realm and environment that produces a safe, convenient and inspiring destination for employees, residents and visitors alike. Membership of the group currently includes landowners, commercial occupiers, and developers with unique interests in the Aldgate area. The White Chapel Building has been innovatively refurbished into a 21st century hub for today’s businesses. New creative occupiers are now setting up including Government Digital Service, Perkins+Will, Reddie & Grose, Shipowners’ Club, Lebara and Unruly Media. With architects Fletcher Priest, we have created a modern reception area, flexible working space and a buzzing café/bar which is run by Grind. Cyclists are well catered for, with secure storage for 187 bikes, showers and changing rooms. The atrium leads out to a landscaped terrace with café seating and direct links to Braham Park. Thomas More Square is a state-ˇof-ˇthe-ˇart business complex in Wapping, London. The venue offers a stunning range of facilities including restaurants, bars and a Fitness First Gym in a prime location adjacent to East London’s St. Katherine’s Docks. Thomas More Square hosts a calendar of engaging events open to both the public & office tenants. The Event Fund is a distinct allocation from the Tower Hamlets Mainstream Grants budget and exists to provide small grants for high quality, public, arts events and festivals. Administered by Tower Hamlets Council Arts, Parks & Events team, it has been operating for a number of years. It supports approximately 40 – 50 festivals or events taking place in the borough each year which can demonstrate innovation, partnership work, improved access and participation as well as increased community involvement and cohesion. London & Partners is the Mayor of London’s official promotional agency. Our purpose is to support the Mayor’s priorities by promoting London internationally, as the best city in the world in which to invest, work, study and visit. We do this by devising creative ways to promote London and to amplify the Mayor’s messages, priorities and campaigns to international audiences. Our mission is to tell London’s story brilliantly to an international audience. The official visitor guide to London, visitlondon.com is a comprehensive resource for everything that’s happening in London. We also have thriving Visit London social media channels and a Visit London app. Located in historical Ivory house , built in 1858 and the only original warehouse still standing in St. Katharine Docks, White Mulberries coffee shop is only a short walk from Tower bridge and Tower hill station. At White Mulberries, we make sure that you are served amazing coffee, cake and great food , while enjoying the stunning views of St. Katharine Docks.